As the depth of winter grips the northern hemisphere and the full force of summer hits in the southern, several headlines warrant attention as people return to their desks after a busy 2014. Of course the cases detailed below warrant further investigation and clarification, but they also highlight the nature of the issues to be addressed and begin to set the agenda for 2015. The PDM-1M version of the mine is only detonated when between 18-26 kilograms of force is applied to the VPDM-1M tilt rod fuze, an amount easily created by the actions of an adult. Wikipedia also has a good description of the PDM-family of mines. The ICBL has consistently stated that mines equipped with fuzes that will detonate the mine due to the unintentional act of a person are considered to be antipersonnel mines and are banned by the 1997 Mine Ban Treaty. States Parties have discussed tilt rods, but have not specifically addressed “anti-landing” mines and the applicability of the Mine Ban Treaty to such mines. It is not known if other State Parties have such mines. At best this mining will create a hazard which may require specialized clearance. It also raises questions about the Ukrainian Government’s capacity of ensuring the effective exclusion of civilians from the effects of these mines as they are required to do by the 1996 Amended Protocol II of the 1980 Convention on Certain Conventional Weapons (CCW), which Ukraine joined on December 15, 1999. 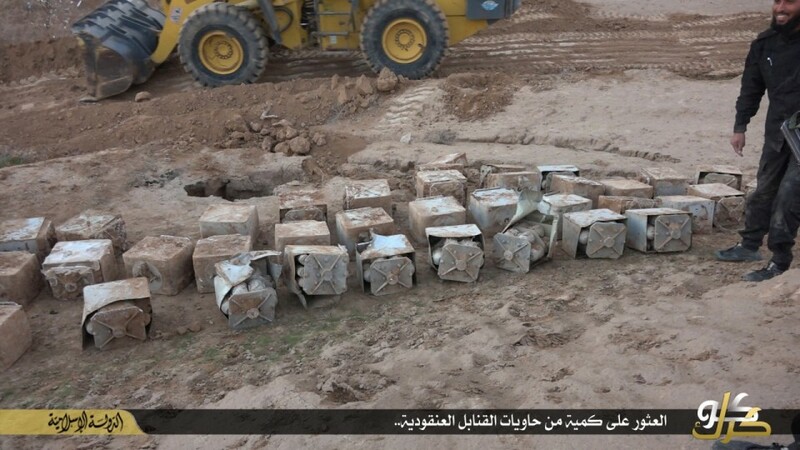 Secondly in Iraq, the official media office in Kirkuk published a series of photographs showing Islamic State forces unearthing on January 5, 2015 at least 34 BKF cartridges containing AO-2.5RT submunitions that were buried in the ground. These cartridges are designed to be loaded into a KMGU dispenser and subsequently dispersed by an aircraft or helicopter. Each BKF cartridge contains 12 “pairs” of AO-2.5RT submunitions, which separate after being released into 24 individual submunitions. These submunitions have a casualty-producing radius of 30 meters against material, 20 meters against personnel in the open and 10 meters against entrenched personnel. In its June 2014 initial transparency report for the 2008 Convention on Cluster Munitions, Iraq claimed not to possess stockpiles of cluster munitions or explosive submunitions. While the circumstances of this find are unclear at this point, it appears that at some point in the past, burial was a method of disposal used for stockpiles in Iraq. The third disturbing news item is from Syria, where there is a picture (below) and an unverified claim made by the al-Nusra Front that it is emplacing mines between their forces and Hezbollah in Qalamoon, a district just northeast of Damascus near the Lebanese border. The picture accompanying the claim shows an OZM-type antipersonnel mine equipped with victim-activated fuze. Forwarded to me by Aris Roussinos, a producer with VICE News, there was no specific mention of when the mines were emplaced. The date of January 2, 2015 was edited onto the photo and it is not clear whether this indicates the date the photograph was taken or the date that it was posted.